This week’s guest blogger is Alex Calamia, who maintains a blog called “Tropical Gardening in New York City“. Born and raised in New York City, Alex is a 4th year Meteorology Student at Rutgers University in New Jersey and he has a passion for weather and tropical gardening! During his spare time he is either keeping up with the latest weather, documenting weather data from his backyard, or caring for his tropical and subtropical garden at home. There’s something about palm trees swaying in a warm breeze on a sunny day that I find inspiring. Maybe it’s because I’ve lived my entire life in New York City – a place with 4 distinct seasons and winters that are sometimes a bit longer than I’d like them to be, especially lately. I’m definitely not the only person around here who loves the tropical look these trees provide since local nurseries sell huge tropical palm trees at a price 3 times their actual worth, and they fly off the shelves! It’s hard to find a nice restaurant even this far north that that doesn’t line their entrances and homeowners who don’t grow a potted palm or 2 on their patio for the summer months. 10 years ago I was the kind of person who would buy a potted palm or 2 and be really happy but nowadays I try to make my yard look as authentically tropical as possible. Just a small disclaimer, all these pics are from my yard here in New York. I broke this post into 5 tips that will help make your yard look tropical. First, here’s a little sample of some of the things I have grown over the years…click on each photo to enlarge. If you love the tropics and are ready to make your yard your daily tropical getaway, here are some tips! These plants opened the world of tropical gardening in a temperate climate for me. They are legitimate palm trees just like those you see in the tropics and just as beautiful in my -very biased!- opinion. I’ve been growing these in my yard since 2009. Here are some pics of a few of my “hardy” palms. Click on each photo to enlarge and read captions. I do give most of my palms in the ground protection during the winter because I want them to look good in the spring. My protection method is pretty easy and it works. I’ve been protecting these palms since I was a freshman in high school so if a 14 year old could do it, most people can! I use C7 or C9 christmas lights (those LED lights do not produce enough heat), a frost cloth, and a garbage bin. Since we rarely hit extreme cold until January, I usually buy the lights after New Years when they are incredibly cheap. These palms often go most of the winter unprotected, but those few cold nights a year are life or death for some species. I protect some palms more than others based on hardiness. Just about everything gets protected if temperatures are in the teens at night although some are cold tolerant down to the single digits. In my climate (USDA Zone 7) Sabal minors and Needle palms are the only palms that will reliably survive our winters without protection, but survive doesn’t mean thrive. A cold winter can kill an unestablished plant and damage established ones. Trachycarpus are also pretty cold hardy and I have seen them survive mild winters without protection but if you want them to look nice, protecting it a few nights a year will make a huge difference! My climate has not limited me from growing many different palms in the ground. Here is a list of palm trees I have gotten to survive a NYC winter outdoors. The oldest ones have been around for 6 NYC winters and counting! If you’d like to know more about my experience with these palms, check out my blog at http://tropicalsinzone7.blogspot.com or contact me, I’d be happy to answer any questions! If you live in a USDA zone below a 6, hardy palms may be too much of a hassle unless you are dedicated to growing them, but everyone can grow plants that stay green during the winter and they are so much nicer than seeing sticks 6 months out of the year. My yard has a lot of Arborvitae shrubs that the previous owners planted over 25 years ago. I am slowly adding more and more evergreen trees to my yard, especially broad-leafed Evergreens (which some abbreviate as BLE’s) because a lot of these do look tropical. 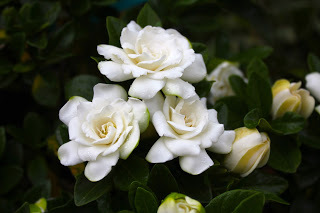 These plants include hollies (hardiness varies but some are very cold tolerant), Southern Magnolias (hardy to about -5F before dieback), evergreen oaks (hardiness varies, some are hardy to below 0F), hardy gardenias (hardy to 5F but will regrow from temperatures around 0F), Oleanders (hardy to about 10F but well worth protecting for their summer blooms), Camellias (some are hardy to -5F, many to at least 5F), Eucalyptus (a few are hardy to about 0F but most are tender), and Yuccas (some are extremely hardy). Of course there are many types of beautiful conifer plants and pines that although aren’t tropical, are lively year round. 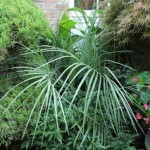 Tip 3: Hardy perennials that look tropical! They may nothing special in the winter, but during the summer they will put on a show! Hardy hibiscus are extremely cold tolerance and have amazing blooms. I actually like them as much or more than the tropical ones. Some hardy hibiscus like Rose of Sharon are not perennials so those are great is you want some more height. There are bananas that show great cold tolerance. This year I am trying Musa Basjoo and Musa ‘Mekong Giant’. I have seen Musa Basjoo survive temperatures below 0F. They are incredible perennials! Crape Myrtles don’t fit into the perennial category since they are trees, but their fast growth and amazing blooms give them some perennial characteristics. They really do get massive though in my climate, mine were 3 feet tall 5 years ago but are now 15 feet tall. Tip 4: Grow perennials that aren’t hardy but look tropical! Even if a perennial isn’t hardy it doesn’t mean that you can’t add them to the landscape as easily as someone in a warmer zone. Although some cannas, Elephant ears, and gingers will survive in a zone 7 they are only reliable in zone 8 and up where the ground does not freeze to hard. I’ve had cannas return and gingers have proven to be extremely hardy for me, but I dig mine up anyway because it’s not with the risk when they are so easy to bring inside. Keep them in a cool room or garage above freezing and they are so care free. Bananas and Brugmansias can be stored similarly. Once you plant them out again in the spring, stand back because your yard will be as filled with these as any yard in Florida in no time! If you limit yourself to only perennials that are only hardy to your zone, then you are missing out! A combination of Elephant Ears, Bananas, Cannas, and Gingers in late September. All these plants are melted by frost in November and rest during the winter inside the house. Tip 5: Grow tropical plants in pots. Potted plants are great if you have limited space in the ground, a patio you want to bring color to, or are just really indecisive and like to change the look of your yard throughout the season. They are especially great for bringing the tropical look because in addition to that you can also grow plants that are truly tropical and bring the look indoors during the wintertime. Because I live in an urban area I have no choice but to grow a lot of potted plants and they do a great deal of the work when it comes to brining the tropical look! When you are choosing tropical potted plants, choose plants that are easy to care for indoors. Anyone who has been to Hawaii has probably come into contact with plumerias. They are tropical flowering trees and shrubs with beautiful fragrant blooms. They make amazing potted plants and are reliable bloomers up here in NYC. They lose their leaves in the Fall here (in the tropics they lose their leaves during the dry season) making them very easy to store indoors for the winter. In the spring take them back out and they’ll sprout leaves and bloom inflorescences! The leaves alone are beautiful and the flowers are amazing. Just make sure it never sees a frost! Tropical hibiscus are easy to keep indoors by a sunny window. They’ll lose most of their leaves going inside and lose them again going outside, but by July and August they’ll look better than the ones at the nursery and reward you with daily blooms until October. You’ll get a few blooms indoors during the middle of the winter if you give it a spot it really likes! Palm trees are the must have potted plants! There are so many different types to chose from. Chamadoreas and Rhapis palms make amazing potted plants because they stay small and do really well indoors and in a very shady spot outdoors. Other easy palms I have grown indoors are Bottle Palms, Spindle palms, Livistonia, Adondilias, and even small Coconut palms. Some people have a hard time keeping them alive indoors, but as you’ll see in my pics, I don’t give them a lot of sun during the winter and they still are pretty happy. It’s important that when you take potted plants back outside for the summer you do not expose them to direct sunlight right away. My large palms spend a month in shade/part sun before going to their final spots for the summer. The less time they spend indoors the better. During mild breaks in the winter I will take some plants outside to get a watering or some real sunshine. 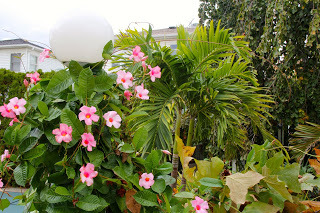 If you’d like to see updated pictures of my yard – and a whole lot of them – visit my blog at tropicalsinzone7.blogspot.com! While planting hardy palms and evergreens definitely extends the tropical look, in my yard at least, much of it goes inside for the winter. The process takes a nice long weekend, but at least it allows me to enjoy the tropics during the cold, short days of winter. I hope you found this post helpful and I’m happy to answer any questions! Really awesome read! Great pictures and content. :) IT always makes me happy to read about other gardens and learn more tips! Too bad I can't have this closer to me! If any one of your readers wants help bringing the tropics to their yard, we can help. Hope you do not mind the link! http://www.ctpalmtrees.com Please keep up the good writing! Wow you are amazing!! I thought i am doing pretty good here in southern n.j. Love what you have accomplished, i am coming over to visit! !